Join TV's Rick and Morty for a sci-fi comedy adventure brought to life with the power of PS VR. Rick and Morty have teleported into your living room for a cutting-edge Virtual Rick-ality adventure. Solve puzzles, step through portals into strange dimensions and find out what it feels like to get yelled at by the smartest man in the universe: Rick Sanchez C-137 (aka 'Terror' Rick). Join the troublesome pair as they fight aliens, press buttons, jump through space and a whole lot more. 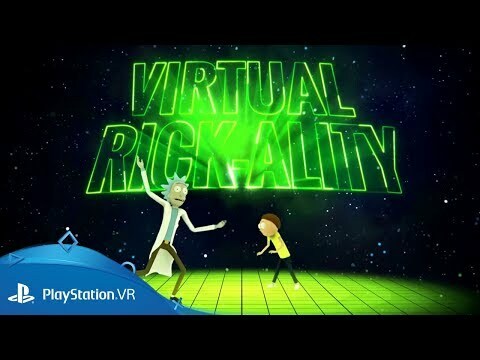 Adapted from Adult Swim's hugely successful animated sci-fi comedy, Rick and Morty: Virtual Rick-ality is your chance to step through the portal. Fully voiced, 3D Rick and Morty goodness. Help Rick (or don't) and explore multiple strange dimensions. Learn how to fix an intergalatic car. Hang out in iconic places like Rick's garage.